I didn’t know a whole lot about architecture or housing styles before we started house shopping years back. But the the more homes you look at, the more you start to pick up on things you really like — and, just as importantly, things you don’t. At first, having rented in fairly crappy Boston apartments our entire adult lives, condos were easier for us to evaluate, while every single family looked like “OMG a whole house!” But after a while I started noticing patterns in the housing stock, and after a longer while I realized that I was developing pretty strong opinions about those patterns. A lot of the starter homes we looked at — 1,100-square-foot capes and the like, especially the ones on Rice Road in our section of Quincy — were built in the 1940s, either during World War II or immediately after it. I started to notice that homes built in that era are rather ruthlessly efficient: concrete foundations, lower ceilings, lots of doors to contain the heat, stuff like that. Anyway, I started to notice that of all the houses we saw — and we toured dozens and dozens of them over the course of two years — my favorites were always the ones from the 1920s. I don’t know if it’s something about the freewheeling extravagance of the Gatsby era in general, or if it’s just the way the houses in Boston were built at that time — many might even have been kit homes — but every one of them felt just right to me. Quincy, a typical “streetcar suburb,” was growing quickly at the time, and the American Foursquares, Dutch Colonials, and “Quincy Capes” that were built around then – alongside multi-family homes like ours – really caught my eye. This is really the biggie: 1920s floor plans seem made to entertain. 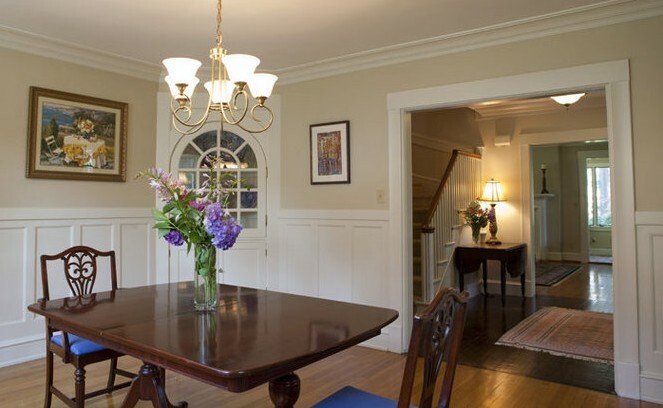 The downstairs rooms are almost always connected all the way around in a circular flow pattern — which, any child can tell you, is perfect for racing around in circles. Instead of doors between rooms, there are often wide, cased openings. And when every room opens into another, and another, it helps to relieve any claustrophobic inklings you might otherwise get in a small house. Plus the floor plans make maximum use of space. We have like 20 square feet of hallway in our entire house — our “hallways” are just little 3′ x 3′ junction areas where multiple rooms meet. Almost every bit of our modest 1,150 square feet is usable space. That efficient floor plan is important when you’re dealing with rather small houses, which most 1920s homes — at least around here — tend to be. Don’t get me wrong, I love the grandeur of five-bedroom Victorian homes and Gilded Age mansions. But I can’t afford that grandeur just yet! These little pearls were built to sate Boston’s population boom and expansion, tucked into city-size lots. The fact that they tend to be modest in size — around 1,500 square feet or less — means they offer old-home charm to the average buyer. 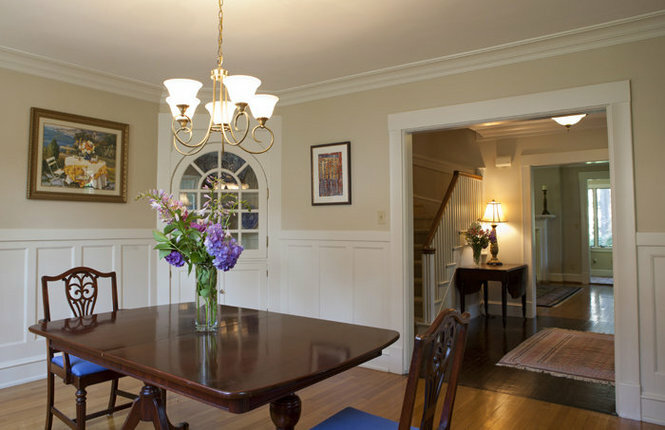 But like Victorian-era buildings — or really everything built in between the hardscrabble Colonial days and the post-WWII period — 1920s homes tend to have nice, lofty ceilings. Again, this goes a long way toward relieving claustrophobia in a smaller home. My wife and I shared a 400-square-foot studio in the Back Bay for years, and the main reason we didn’t feel like the walls were closing in on us was the grand, 12-foot ceilings. Ours are a more modest nine feet high now, but it’s still plenty roomy and airy. Plus, high ceilings are an old design trick that can help you get through hot days without air conditioning. Post-war housing often tends to have lower ceilings — less air to cool or heat — that feel, to me (and I’m short! ), pretty psychologically suffocating. 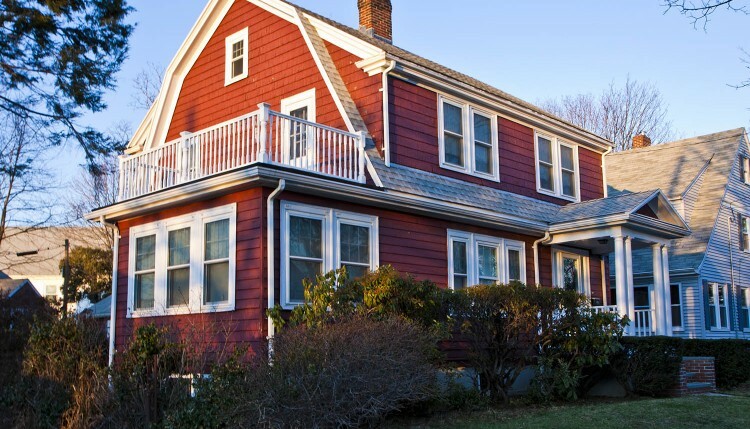 This 1922 Dutch Colonial has all the calling cards of a sweet old house: Built-in hutch, detailed molding, wood floors, high ceilings, and cased openings instead of doors for a flowing floor plan. Almost every 1920s house we looked at had a pantry, and having lived with ours for eight years now, I can’t imagine life without one. We cook at home a lot. I don’t need a walk-in closet for my clothes — I need one for my food! Our good friends have a two-family with almost the exact same layout as ours, and they busted down their pantry to expand their kitchen. It came out really nice, and people have encouraged us to do the same… but I’m not willing to sacrifice it. My wife isn’t a huge fan of these, and would like to cover them up — I guess not everyone wants giant hunks of scorching hot metal around the house — but I absolutely love them. My grandmother had the same radiators in her house, and I remember coming in from the snow and leaning right up against them to warm up — barely, though. Otherwise, ouch! But I’m not the only one who loves them. This Old House waxes poetic on the virtue of the iron radiator, and its time-tested ability to gently, efficiently heat a room in style. Baseboard heating? Forced hot air? Not for me. And the beauty is, they’re not even that special around here. Beautiful old homes are everywhere around Boston – you just have to hope someone didn’t mess them up too much between then and now.